In addition to the new iPhone 5, Apple unveiled new generations of its iPod touch and iPod nano, which the company still calls "music players" although they both do much more than play music. Like the iPhone 5, both the new iPod touch and the new iPod nano will incorporate Apple's new Lightning dock connector, that is smaller than the previous connector used in these devices. A larger 4-inch display––the same Retina display found on the iPhone 5. A vastly higher resolution rear-facing iSight camera––5 megapixels for still photos and 1080p HD for video recordings, up from 0.5 megapixels and 720p respectively in the fourth-generation iPod touch––with the additions of autofocus, face detection, an LED flash, image stabilization when recording videos, and the ability to shoot panoramic still photos. Apple's dual-core A5 processor chip, previously found in the iPhone 4S, which provides "up to twice the processing power" and "up to seven times faster graphics" than the chip that powered the fourth-generation iPod touch. Siri voice control, which debuted in the iPhone 4S. In addition, Apple has made the new iPod touch thinner and lighter than ever before. It now is just 6.1 mm thin (reduced from 7.2 mm) and weighs only 88 grams (reduced from 101 grams). A brushed aluminum back should be less prone to scratching than the shiny metal back used in previous generations of the iPod touch, and this new back is now available in a selection of colors: pink, yellow, blue, white and silver, and black and slate. Pricing has been set at $299 for a 32-gigabyte model and $399 for a 64-gigabyte model. Meanwhile, the iPod nano has been resized yet again. It now is longer, with a 2.5-inch "Multi-Touch" display and a small "Home" button like that found on the iPhone and iPod touch. Bluetooth, for wirelessly streaming audio to accessory speakers, headphones, and compatible car or home audio systems. The longest claimed battery life for music playback of any iPod nano––up to 30 hours, Apple says. The thinnest profile of any iPod ever––just 5 mm. Pricing for the new nano is set at $149 for a 16-gigabyte model, and it, too, will be available in a selection of seven colors: pink, yellow, blue, green, purple, silver and slate. 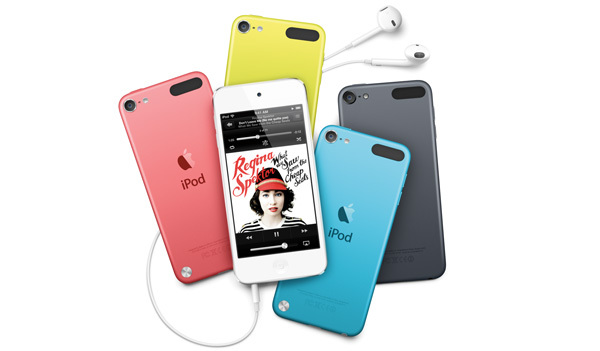 Both the new iPod touch and the new iPod nano will be available in October.